This 2007 photo shows Somerset County Cpl. 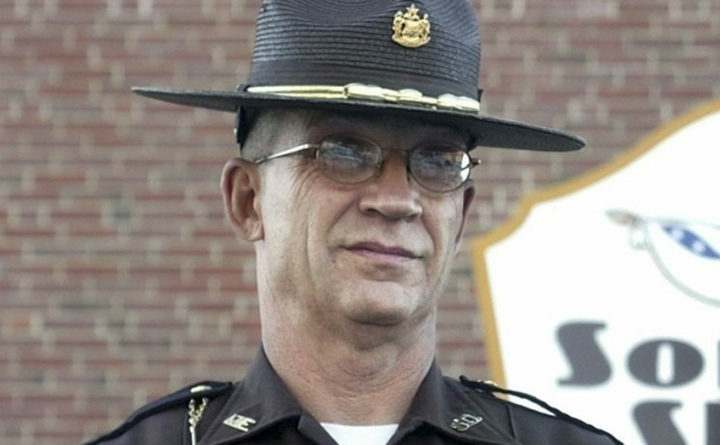 Sheriff Eugene Cole , who was killed early Wednesday, April 25, 2018, in Norridgewock, Maine. A search is underway for a suspect who stole the deputy's cruiser and robbed a convenience store afterward. Somerset County Sheriff’s Cpl. Eugene Cole was remembered by friends and colleagues as a generous, affable man who was skilled at negotiating in tense situations. “Anytime he could defuse a situation without having to use excessive force, that’s the way he would do things,” he said. Cole, who lived in Norridgewock and worked for the Somerset County Sheriff’s Office for 13 years, was shot and killed early Wednesday morning by 29-year-old John D. Williams, of Madison, police said. The killing spurred a nationwide manhunt. Williams had still not been found by Wednesday evening. Those who knew Cole were reeling from the loss in the hours following his death. “As an officer, he was well-mannered and treated us with respect,” Reynolds said. Cole would stop by the Canaan fire station frequently, sometimes a few times a week, depending on his shifts, said Bowden, who has been with the department since 1999 and became chief six years ago. Bowden made sure Cole had a key to the station during night shifts, so he could come in to use the bathroom or make a pot of coffee. Cole was a skilled guitarist who used to play in a band called Borderline Express, said Scott Bishop, who was at one point related to Cole by marriage. Condolences for Cole poured in from around the country. Republican Gov. Paul LePage expressed his condolences to Cole’s family in a series of tweets Wednesday, and directed that all U.S. and state flags be flown at half-staff for at least three days to honor the fallen deputy. Cpl. Cole served his community with honor. His sacrifice will not be forgotten. Our thoughts are also with all of Maine’s law enforcement community as they mourn the loss of their colleague. We pray for their continued safety. Please continue to cooperate with them and be safe. “He served his community with honor, and his sacrifice will not be forgotten,” LePage said. Republican U.S. Sen. Susan Collins and Independent Sen. Angus King, also expressed sadness over Cole’s death. Republican U.S. Rep. Bruce Poliquin said he was “horrified” to learn of Cole’s murder. I am deeply saddened to learn Cpl. Eugene Cole was killed in the line of duty in Norridgewock this morning. Cpl. Cole served the citizens of Somerset County for 13 years with honor & distinction, & Maine will be eternally grateful for his brave actions to protect his community. I’m heartbroken by the loss of Corporal Eugene Cole, a 13 year veteran of the Somerset County Sherriff’s Office. Praying for his family and friends, and the many law enforcement officials working to capture his killer. I am absolutely horrified and heartbroken by the reports this morning of the killing of one of our brave law enforcement officers, Deputy Sheriff Corporal Eugene Cole, in Norridgewock, who was responding to an incident and preforming his duty. Our hearts go out to the family and friends of Corporal Eugene Cole in this time of terrible loss, and our deepest thanks to the brave men and women of law enforcement working to keep us safe today and everyday. Police departments across the country joined in remembering Cole. The Boston Police Department offers our deepest condolences to the family, friends, and coworkers of Deputy Corporal Eugene Cole of Somerset County, Maine, who was killed in the line of duty. Our thoughts and prayers are with you. Our thoughts and prayers go out this morning to the Somerset County Sheriff’s Office and to the family, friends and coworkers of Corporal Eugene Cole. Correction: Because of incorrect information provided by law enforcement, this story previously misstated Somerset County Deputy Cpl. Eugene Cole’s age.